Within the Marvel Cinematic Universe, Captain Marvel serves as a prequel to all the present day stories. Set in the year 1995, it follows the story of Carol Danvers. When the film begins, Carol is on the alien planet Hala and a member of the Kree Empire’s elite Starforce; she goes by the name Vers. She has no memory of her past – who she is or where she is from. 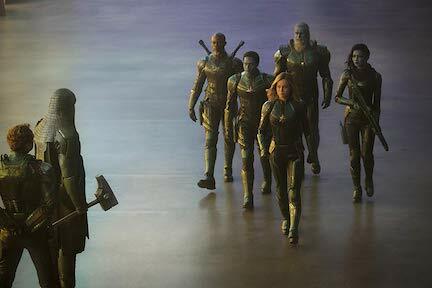 In a failed mission to rescue a Kree operative, Vers is captured by a group of Skrulls. The Skrulls are another alien race and they are at war with the Kree. The Skrulls search Vers’ memories and by this process Vers sees glimpses of her past life. Vers manages to escape and crashes on earth where she is discovered by SHIELD agent Nick Fury. Together, they learn of Vers’ past on earth and seek to avoid the Skrulls who are trying to recapture her. At a top-secret “Project Pegasus” base (an operation of the U.S. Air Force), they learn that Vers is Carol Danvers, an Air Force pilot who became involved with a secret project and has been presumed dead for several years. Along the way, we learn the true nature and source of her powers. The following spiritual connections contain spoilers for the film. The Nature of Evil: Through most of the film, appearances lead you to believe that the Kree are the “good guys” and the Skrulls are the “bad guys.” The Kree are ruled by the Supreme Intelligence, some sort of highly advanced artificial intelligence. The Supreme Intelligence is credited for teaching Vers how to use her powers, which she struggles to control. The Supreme Intelligence takes the form of whomever is most respected by the one speaking to it. When Carol interacts with the Supreme Intelligence, she sees a former mentor (though she cannot remember who this is until later). In the end, however, we learn the truth. The Skrulls are not the evil ones. They are seeking refuge from the Krees who destroyed their home world. The Supreme Intelligence has not been helping Carol use her powers, but rather inhibiting them and controlling her. When Carol learns the truth, she breaks free from this control and in the end leaves earth to help the refugee Krees find a world on which they can dwell in peace. Scripture tells us that Satan “disguises himself as an angel of light” (II Corinthians 11:14). Much like the Supreme Intelligence in Captain Marvel, Satan distorts things in order to make wrong look right. We see examples of this in the political world where abortion is portrayed as being essential to women’s healthcare. We see examples of this in the entertainment world where shows like TLC’s “Long Island Medium” depict people engaging in the things of the occult (in this case, trying to contact the dead, something strictly forbidden by Scripture). There it’s presented as being heart-warming, family-friendly entertainment. We see examples of this in our own lives with whatever sin most appeals to us. In the end, however, Scripture reveals the truth to us: the evils that Satan tries to dress up are grievous wrongs. Love Your Neighbor: The war between the Kree and the Skrulls is central to this story. Vers (Carol) has been fighting against the Skrulls as part of the Kree elite military team “Starforce.” This is her very vocation. Things get turned upside down when she learns the truth. The Kree are not engaged in a just war with the Skrulls by any stretch. They are instead conquering them for the sake of conquering. Carol is horrified to learn the truth. Her view of war is very much in line with Scripture’s. Carol is a soldier who will fight to protect the innocent, but she will not fight to conquer the innocent (see, for example, Romans 13). So, she completely changes sides. This turns all that is familiar to her upside down. “You shall love your neighbor as yourself,” Scripture teaches (Matthew 22:39). Lutherans in particular are familiar with our “neighbor” being defined as “anyone who needs our help.” The Skrulls needed Carol’s help. In the end, she was the only one who could defend them against the Kree and help them find a home world of their own. Even though she had only recently returned to earth and was still regaining her memories, Carol chose to leave earth once again. The film ends with her journeying into space with the rescued Skrulls in order to find a place for them to live. She sacrifices what she had regained, her life on earth, to help them. Gender Roles: Some prominent conservative bloggers have attacked this film as “feminist propaganda” (one in particular labeled it as such without having seen it). Marvel execs have certainly used the word “feminist” in a positive way and lead actress Brie Larson very publicly embraces the modern-day feminist movement as it promotes things contrary to Scripture. This has led to a fair amount of backlash against the movie in conservative circles. However, the content of the film is not feminist, at least, not in the way you would be led to expect. Carol certainly deals with mistreatment from boys and men. She is at times treated in a way that is sexist. To a certain degree, Carol’s strength is attributed to her resolve in overcoming this. However, what is depicted is not an exaggeration of what happens in the world today, and the film by no means implies that all men are sexist or that “the patriarchy” is the problem with the world. Even Carol’s true power as a superhero has nothing to do with feminism. Whereas Captain America was chosen for the Super Soldier Serum because of his impeccable character, and Thor wielded Mjolnir because he was “worthy” of it, Carol’s superpowers are the result of an accident and the power of one of the infinity stones (the Tesseract or “space stone”). She is more like Bruce Banner, someone empowered through an accident with an outside power source. If Marvel was attempting to make a feminist propaganda film, then they did a poor job. Unless one thinks that promoting women in the military or women as superheroes is inherently feminist in an anti-Biblical way, there really is very little, if anything, in the film that is “feminist” in the way that Christians would find troublesome. This is not to say that Captain Marvel teaches the proper Biblical gender roles or even that we expect superhero movies to do that. We look to Scripture to understand gender roles in the home (Ephesians 5:22-33) and the church (I Timothy 2:8-15), and I highly doubt that any modern superhero film would intentionally teach us the differences between men and women (especially in today’s social and political climate). Yet, broadly speaking, there are things in this area that Captain Marvel does remind us of. Carol is at times mistreated simply because she is a woman. This is contrary to God’s Word. Scripture does not teach that men or women are superior to the other. When it comes to our sin, we are all in need. When it comes to our Savior, we are one in Him (Galatians 3:28). Scripture does teach that we are to treat our neighbor, male or female, with kindness (Ephesians 4:32). Captain Marvel is a largely family-friendly film, as much as PG-13 films can be. There is a little bit of bad language (but far less than many PG-13 films). There is very little content that has any sort of sexual references. The violence is far more “comic book violence” than disturbing violence. In the Marvel Cinematic Universe world, this film is much closer to the Captain America films than the Iron Man films as far as objectionable content goes. Captain Marvel is another smash success for Marvel. As of March 27th, it has grossed $938,086,403 and it should become the 7th Marvel Cinematic Universe film to pass the one billion dollar mark. As a film, it at times struggles in the way prequels often do: there are a few confusing plot holes when you consider the rest of the MCU, and a few things that feel forced to fit in with the rest of the MCU. Nevertheless, it is a solid film and any Marvel fan will definitely want to see it. As always, remember to stay all the way to the end!